An icy shell separates Titan's organic-rich surface from its liquid ocean. If organic material manages to penetrate that shell and travel to the water beneath, it could provide the necessary ingredients for the evolution of life as we know it. When NASA's Cassini mission arrived at Saturn, it pressed through the haze surrounding the ringed planet's largest moon, Titan, to reveal a complex, liquid-covered world with the potential to support life. Now, researchers are proposing a return to Titan with a mission that would investigate not only the flowing methane and ethane on its surface, but also the ocean beneath. "It's really important that we go back to Titan," Michael Malaska told fellow scientists at the Astrobiology Science Conference in Mesa, Arizona, in April. Malaska, a researcher at the Jet Propulsion Laboratory, is part of the team proposing Oceanus, a mission with the goal of studying the moon's habitability. In April, Oceanus was submitted as part of NASA's New Frontiers mission competition. The New Frontiers program seeks to explore the solar system with frequent, medium-class spacecraft missions engaged in focused investigations. In addition to the ocean worlds Titan and Enceladus, the current round of proposed investigations features goals that include sample return from the moon or from comets, a study of Saturn or Venus, or a rendezvous with the Trojan asteroids of the outer solar system. By studying the organic material and landscape features, as well as capturing more detailed images, Oceanus would investigate the organic and methane cycle on Titan and probe what's going on beneath the surface. Titan boasts an intriguing surface, with organic-rich hazes and flowing liquids. With its liquid presence fueled by energy from the sun, the planet bears a strong resemblance to Earth. Instead of water, however, Titan's atmosphere and surface are dominated by methane and ethane. The presence of these hydrocarbons in the upper atmosphere forms what Malaska called "a complex organic chemical factory," while it is the only solar system other than Earth to contain flowing lakes and rivers. Some scientists have suggested that life, which may have followed a completely different path than it took on Earth, could evolve on Titan. The three necessary ingredients for life as we know it include organic material, a source of energy and water. Titan's exterior holds the first two: Energy streaming in from the sun may be captured in the form of high-energy molecules. "You can almost think of it as manna from heaven," Malaska said. While the surface doesn't contain liquid water, that doesn't mean it isn't present on the moon. "Remember that Titan is an ocean world," Malaska said — there's a potential large ocean of liquid water beneath the surface. When paired with the rich organic surface, that ocean could provide a home for life as intriguing as the two most well-known ocean moons, Saturn's satellite Enceladus and Jupiter's moon Europa. All three have an icy layer shielding their ocean, though Titan's lies beneath its rich organic surface. But while Europa and Enceladus must rely on interactions with the rock to build a habitable environment where life could evolve, Malaska said that Titan's ocean could get a little help from the surface, which is also a potential home for life. Previous experiments revealed that exposing simulated Titan organics to water generates some of the molecules necessary for life as we know it, such as amino acids and nucleobases. 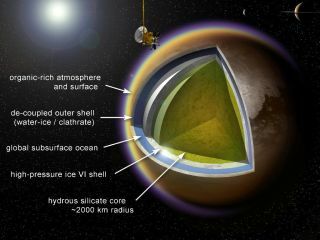 Oceanus would make in-depth investigations of surface features identified by Cassini, such as suspected ice volcanoes, impact sites and other signs of tectonic processes. The spacecraft would also examine the ice shell to determine if it is convecting, with warm material rising and colder material sinking. Convection could help to carry surface material through the ice and into the ocean, as well as bring water to the surface. If the mission were chosen, Oceanus would spend two years orbiting Saturn, making flybys of Titan, Malaska said. Then it would settle into a two-year orbit around that moon. The spacecraft would carry three instruments to help study the surface and subsurface. A mass spectrometer would analyze the chemistry of the heaviest molecules in the atmosphere to understand how they interact, Malaska said. An infrared camera would follow how the organic material moved across the surface, and potentially how it interacted with water near the surface. And a radar altimeter would examine tectonic activity. Together, the instruments would not only provide a glimpse of the surface, but also how material might cycle through the crust through geological processes, providing "the building blocks for life to a water-rich environment," the team said in its abstract. Before Cassini caught a glimpse in 2004, Titan remained shielded behind a haze of organic material. The spacecraft revealed an intriguing surface, with seas of methane and ethane; rivers; and deltas and dunes (not to mention 'magic islands' that appear and disappear). "Cassini revealed an absolutely beautiful landscape that is alien and bizarre, but also Earth-like," Malaska said. But although Cassini revealed insights about the moon's features, its images could only resolve the largest, kilometer-size features. Oceanus would take advantage of orbiting Titan to capture far more detailed images, down to 82 feet (25 meters) per pixel. A study of Titan could provide insights about the early Earth. According to Malaska, the methane-rich moon may be an analogue of our own planet, before the rise of oxygen. "Effectively by going to Titan today, we could be going back in a time machine to early Earth," he said. But while Earth is all about the water, Titan is all about the hydrocarbons. That's the trail Malaska and his colleagues hope to pursue with Oceanus. "We're going to study the molecules from their source," Malaska said. "So we're effectively going to follow the organics."